Join us for a top-class evening on Thursday 24th Nov 2016 at the Waterfront Hall to honour the high achievers of the Northern Ireland business community as well as the public sector. Both leading individuals and companies will be recognised on the night. 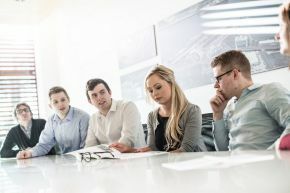 Ulster University Business School is proud to sponsor this brand new category which sets out to identify the achievements of Northern Ireland’s young (35 years old or under) entrepreneurs and business leaders, with entrants able to demonstrate clear achievement and dynamism in their chosen field. Judges include UTV's Business Correspondent Jamie Delargy, Business Eye Editor Richard Buckley as well as the Business Editor of Northern Ireland’s main morning newspaper Gary McDonald of the Irish News. The closing date for entries will be Friday 21st October, 2016 and judging will take place shortly after that date.